Discussion in 'Online Games - News and Reviews' started by Kotsy, May 8, 2013. Step into enemy territory with this battle ground set on water. 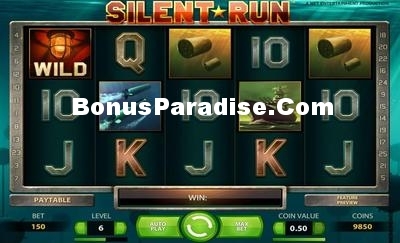 SILENT RUN has special Wild symbols and an explosive Bonus Round. Wild symbol substitutes for all symbols except the Echo Wild and the Bonus symbol. Echo Wild symbol only appears on reel 3. When Echo Wild appears, it sends out 3 sonar signal searching for hidden Wild symbols and could make some incredible winning pay lines. 2 and 5 Torpedoes. You then fire your Torpedoes into enemy ships revealing a win amount. The win amount is also multiplied to the multiplier attached to that Torpedo.